And another kilomilestone, 25000 KM today! 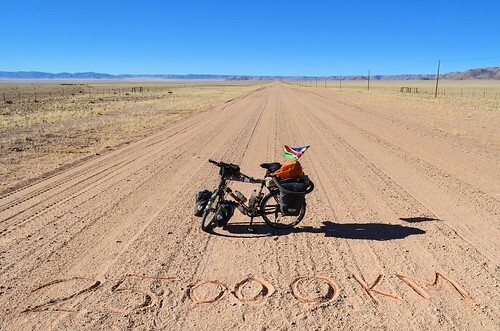 It’s now less than 900 km to Cape Town as the crow flies. I’m in Aus, a village in Southern Namibia, the first village since I left Windhoek 15 days ago. The first village with electricity and a tar road. During these days, I cycled along the Namib desert, and it was another splendid ride. From my gravel roads, that see less than 10 cars (and a bicycle) per day, I have seen lots of wildlife: springboks and oxyx every day, but also jackals, ostriches, zebras, etc. I climbed up the largest dunes in the world, next to which Merzouga in the Sahara and Khongoryn Els in the Gobi look like baby dunes. I woke up petting cheetahs that were flown to a remote farm for a Vogue photoshoot with the stylist of Michael Jackson. I had unexpected rain, I slept in sub-zero temperatures with frost in the morning, it’s real winter. Tonight I’m wearing all my clothes again. After repairing my stove and patching my air mattress, I’ll be ready for another freezing night out. Tomorrow, I will be crossing the forbidden area, the Sperrgebiet, a land almost as big as Belgium, where De Beers collects diamonds exclusively, until Lüderitz. Courage pour la fin ! Congratulation man, you are having an amazing journey! Thank you for sharing! What a journey! Congrats from here. Always a pleasure following your travel trough AFRICA. Waow, une fois de plus bravo pour cette étape qui te rapproche toujours plus de ton but ! Moins de mille kil, mais dans le froid cette fois…bon courage ! Contente de te lire et se savoir que tu ne vas pas rester en Namibie faute de place sur ton passeport pour ton prochain visa ;D ou d’être un immigrant illégal en Afrique du Sud. Prends soin de toi et de ta monture !! !